Peter Drucker was widely considered the father of modern management. His 39 books and countless scholarly and popular articles predicted many of the major economic developments of the late twentieth century, and his influence upon modern business is almost immeasurable. In The Strategic Drucker, Drucker associate and student Robert Swaim has distilled Drucker's most important business strategies and philosophies into one valuable book. Swaim recounts and compiles Drucker's insight on growth, strategic planning, sales, marketing, innovation, and a wealth of other vital business topics. 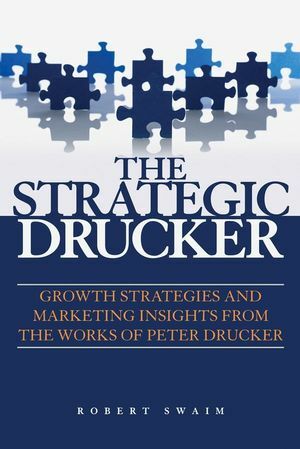 For anyone who wants to get to know the real Drucker, without digging through all of his books and articles, The Strategic Drucker is a valuable resource. Robert Swaim, PhD (Beijing, China), has taught at numerous universities around the world and collaborated with Peter Drucker in developing an MBA and executive development program for Chinese executives and managers. Robert W. Swaim, Ph.D., combines over 40 years of practical international business experience with a distinguished record of teaching and graduate level research in the field of management and executive development. He collaborated with Peter Drucker in developing Drucker’s over-65 years of contributions to management thinking into an EMBA and Executive Development Program for Chinese executives and managers in China. Dr. Swaim is president of the Coto Group, Inc., a management consulting firm which provides corporate finance and other advisory services to both privately held and public companies on the domestic and international levels. He has held executive positions with the Geneva Companies, a middle market merger and acquisition firm, Occidental Petroleum where he was instrumental in the integration of the Cities Services Companies, the second largest acquisition in U.S. history at the time, and sales and marketing positions with Mobil Oil and Xerox. Dr. Swaim completed his doctoral work at Claremont Graduate University (Drucker Graduate School of Management) and also holds an MA in Management from Claremont; an MBA from Pepperdine University; and a BBA from the University of Pittsburgh. He has served as Associate Professor of Management and Organization Development for the University of San Francisco Graduate School. Based in Beijing, Dr. Swaim is a Visiting Distinguished Professor of Management and has taught strategy, marketing and other EMBA courses for the University of International Business & Economics (Beijing), Beijing Institute of Technology and Renmin University (Beijing). Preface: Peter F. Drucker (1909–2005). Chapter 1 Drucker on Managing Growth. Chapter 2 Strategy and the Purpose of a Business. Chapter 3 Dissecting the Interview and Drucker on Marketing. Chapter 4 The Five Deadly Business Sins. Chapter 5 Innovation and Entrepreneurship. Chapter 6 Getting Rid of Yesterday. Chapter 7 External Growth Strategies. Chapter 8 Family Business Management. Chapter 9 Drucker and the Next Society. Chapter 10 Planning and Managing Organizational Change. Chapter 11 Strategic Planning: The Entrepreneurial Skill. Chapter 12 Strategic Decision Making. Appendix A Strategic Management Application Tools.